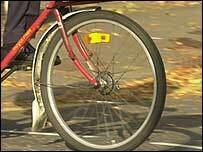 An appeal has been launched for more cyclists in Devon and Cornwall to become "cycle rangers". The volunteer rangers are needed to help maintain local sections of the National Cycle Network. The work includes picking up litter, improving signs, cleaning graffiti and cutting back overgrown vegetation. A recruitment day is being held in Plymouth on Saturday. The cycle network is supported by Sustrans, a charity which promotes sustainable transport. There are about 1,500 volunteer rangers across the UK, looking after nearly 10,000 miles of cycle routes. Among the more well known routes in Devon and Cornwall are the Devon Coast to Coast, the Cornish Way, the Camel Trail and the West Country Way. The routes are some of the most popular in the country and are used by thousands of local people and tourists every year. Devon and Cornwall county councils have each pledged about £5,000 to the ranger programme. Volunteer ranger Richard Ayres said: "There's two main things to being a ranger. One is keeping the route clear of tree branches growing along the side and brambles. "The other main thing is keeping the signs clear, because we don't people getting lost on the routes." "I would recommend it strongly. It's not a big time commitment if you just go along your route once a week."